Only job relocation makes this fantastic log cabin available in such a convenient location. Tranquility privacy & roaming wildlife await your arrival at this rustic retreat. Complete with a 50 x 30' barn w/ new natural gas heat concrete floor area for box stalls & large storage loft. 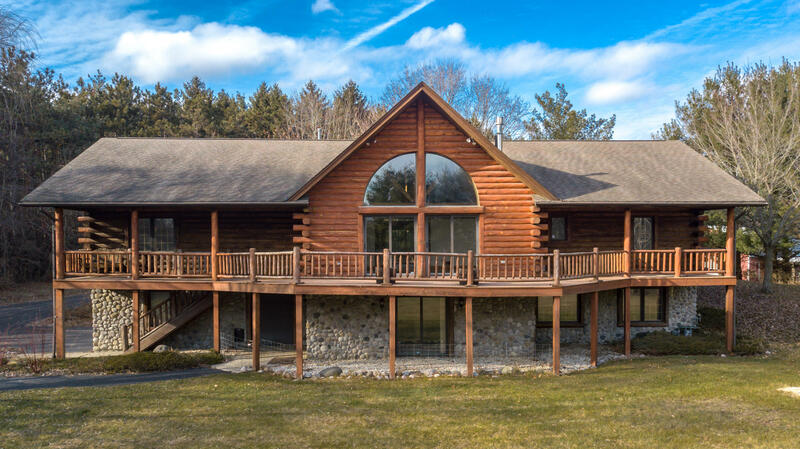 Wow - custom built hunting stand & nearly 6 acres of wooded terrain - up to 6 horses allowed too! Home features 5 bedrooms 3 full baths 2 decks & 3700 sq ft of living space. Exposed timber ceilings & multiple fireplaces will have you feeling like you live in the north woods. Other bonus items: kitchen w/granite counters & pantry 3 season room wine cellar in LL & master suite w/cathedral ceilings & walk in closets. The exposed finished walk out basement offers even more living space and storage space.